Just as was true with the last Adventure Pack, Temple of the Deceived only contains two attachments. Yet one of them just so happens to be potentially one of the best cards in the entire cycle. With that little tidbit to wet your whistle, there’s very little choice other than to keep on reading! Attach to a Leadership or sentinel hero. First of all, this card is the Leadership equivalent of Unexpected Courage. Granted, there are some meaningful limitations here, such as that this attachment can only be put on Leadership or sentinel heroes, or the fact that it can only ready the attached hero after he/she defends. Still, if you think of this card as a dedicated Unexpected Courage for defenders, the power becomes clear and the limitations slip away. Often, defenders are primary targets of readying effects anyway, as you’ll often need ways to block multiple attacks. Armored Destrier isn’t just valuable for defending more than once, however, it also allows the attached hero to ready for an attack as well if that is the better option. Of course, just focusing on the readying effect and calling this card a “Leadership Unexpected Courage” does it a huge disservice, as there is also the added bonus of discarding a shadow card from play as well. If there’s one thing a defender needs more than readying, it is probably the ability to deal with shadow cards. After all, combat wouldn’t be much more than a math exercise if it wasn’t for the unpredictability of shadow effects, which are designed to find ways past your sturdiest defenders. Armored Destrier helps counter this aspect of the game. While the Destrier doesn’t have the raw power of A Burning Brand, nothing else in the game does. It is limited shadow cancellation in that it can’t help with the attack that you use to trigger Armored Destrier’s response. Instead, it lets you discard a shadow card from another enemy engaged with the defending player. Note that this means if you are defending for another player with sentinel, you will apply this shadow discard to another enemy engaged with that player, not yourself. Either way, discarding a shadow card means that the attached hero is now ready and able to defend this second enemy without worrying about a shadow effect (assuming that this second enemy doesn’t have multiple shadow cards). Of course, Armored Destrier is much more flexible than just allowing the attached hero to defend against two enemies with the second enemy’s shadow dealt with, although that is powerful enough on its own. The shadow discard also means that some other character can defend against that shadow-less enemy, perhaps an ally that is normally more vulnerable to shadow effects. You can even take that second shadow effect undefended safely if you’d rather use the attached hero to launch a counter-attack. Using the Armored Destrier does involve some skill and choices, then, as it becomes important which order you defend enemies. For example, it is often advisable to defend against the enemy with the lower attack first, as you can then remove the shadow card from the enemy with the higher attack, preventing the possibility of their attack being boosted even higher or benefiting from the dreaded “attacking enemy makes an additional attack.” On the other hand, sometimes you might actually want to defend against the enemy with the higher attack first, so that you can remove the shadow card from the lower attack enemy, allowing a weaker character to take the attack or setting up an undefended attack. I have yet to draw this card and be disappointed or wish that I had drawn something else. In fact, every single time it has hit the board, it has had an incredible impact on the game. As such, there’s no way to really overstate the case for this card. There may be some Leadership decks that don’t use this card, because they rely entirely on allies or chump blockers for defense, but those cases are the exception. In most cases, Armored Destrier should be an automatic include in any deck where a Leadership/sentinel hero is included, unless that hero will absolutely never be used for defense. 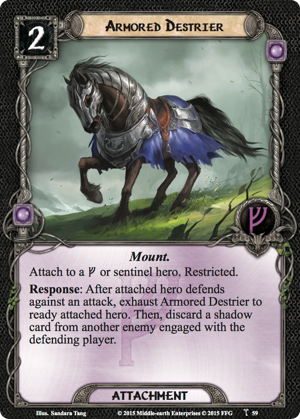 Much as Gondorian Shield was one of the defining cards of the Against the Shadow cycle, Armored Destrier will be one of the defining cards of the Dream-chaser cycle. Play Entagling Nets into the staging area, unattached. If unattached, attach Entangling Nets to the next eligible enemy that enters the staging area. Attached enemy gets -2 and -2 . I’m a huge fan of trap decks with their one big weakness being that quite a few quests can be quite unfriendly to traps. Entangling Nets doesn’t necessarily do anything to mitigate that circumstance. However, it has instantly become one of the best trap options available. Ranger Spikes will probably always be the trap of choice, but there are some advantages that Entangling Nets provides over it that make it quite intriguing. First is that Entangling Nets only costs 1 resource, which means that it is a free play (and free card draw) if you control hero Damrod. This lack of a cost is a huge deal. Previously, many players (including myself) included Ithilien Pit in Damrod decks simply to have a 0-cost trap that would trigger Damrod’s card draw, regardless of whether the Pit had any real game impact or not. Entangling Nets, by contrast, does provide a tangible benefit more often and therefore might just push Ithilien Pit back into the shadows. 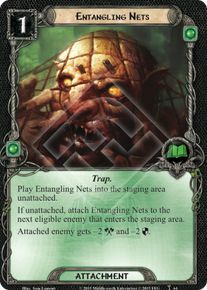 The second aspect of Entangling Nets that gives it a potential advantage over Ranger Spikes, at least in certain decks, is that it allows you to engage an enemy, while simultaneously neutering it, which is valuable for deck types that want to engage enemies. The Dunedain are of course a good candidate for using this trap, and I would probably throw it into a Dunedain deck with Lore even outside of a strict trap deck. Dunedain decks want to keep enemies engaged with them over several turns to trigger certain benefits and Entangling Nets provides another way of allowing this to happen without valuable characters being destroyed. I’ve spoken before on this blog how single points of attack or defense here or there can be quite meaningful, so reducing an enemy’s attack AND defense by 2 is massive. Suddenly that 3 attack enemy, which is a medium attack these days, is hitting you with a mere slap at 1 attack strength. An enemy with a high attack of 5 would be brought down to a much more manageable 3. 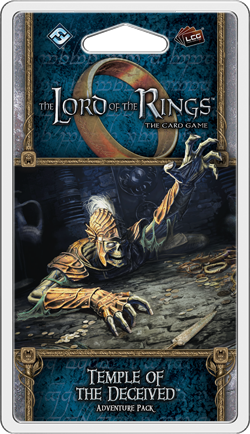 Dunedain decks aren’t the only type that could benefit from this trap, as Hobbits could also use Entangling Nets to engage an enemy to trigger Pippin’s card draw or Sam’s ability while reducing the enemy’s ability to do damage. This trap also lowers enemy defenses (although I think the reduction of enemy attack is far more important), making it easier for weaker characters to dispatch the enemy, or even allowing some shenanigans with Straight Shot if that’s where your tastes lie. Entangling Nets could also be a particular boon for hero Beorn, who doesn’t have any means of boosting his own defense, so finding ways to reduce enemy attack is a great way to skirt that limitation. As with most traps, Entangling Nets is better if you can somehow pick and choose the enemy it will land on. Entangling Nets may perhaps be especially susceptible to being “wasted” on a weak enemy, although truly weak enemies are few and far betweeen these days. Scrying is incredibly useful to make sure that this trap goes on the ideal target. It could be as simple as using Henamarth Riversong in solo or extending yourself to less consistent effects in multiplayer, such as Palantir, Risk Some Light, and Scout Ahead. Still, even reducing a weak enemy may be a net gain for you. The real weakness of Entangling Nets, if there can be said to be one, is that it is devoting a card and resource (if you don’t have Damrod) to neutralize a single enemy, with the trap being discarded when that enemy is removed. However, this is true of all traps, and there are ways to recycle them in a dedicated trap decks. There is also the drawback that, unlike Forest Snare, the enemy will still attack and therefore benefit from shadow effects, which might just hurt you. In non-trap decks, it may or may not be worth including Entangling Nets for the Dunedain or Hobbits, but it’s certainly worth consideration at a cost of only 1. This may be the first trap since Ranger Spikes/Forest Snare to see some play outside of trap builds, and although I’ve pitted Spikes and Nets against each other in this review, there’s really no reason to pick one over the other in a trap deck. Simply include both and profit. The attachments of Temple of the Deceived have been reviewed, and the events are just around the corner! Readers, what are your thoughts on the attachments in this pack? What are your favorite uses for Armored Destrier? How good is Entangling Nets? Armored Destrier can be used by Dori. I definitely want to try that in multiplayer and see if it enhances his value. Well, I disagree with you on one point only. There is a leadership defending heros which I whould not use with the destrier, and it is Elladan. I much prefer giving him a shied and elven plates as restrictived attachments. That’s fair. It would be hard to replace the Shield/Elven Mail combo. I could potentially see someone using the Destrier if they wanted some extra shadow protection for Elrohir and didn’t need the sentinel or extra hit points from Elven Mail. As you mentioned above, entangling nets is really good with Hero Beorn. Both aspect of it are awesome with him. There are a tone of enemies with 3-4 attack, and entangling nets makes it so that he can block those almost with impunity. Similarly, it’s very common for enemies to require 6-7 attack to destroy them. Beorn attacking alone often falls frustratingly short. I’ve had really good luck with a pippin+damrod+beorn deck throwing down entangling nets with abandon. Very cool! I’ll definitely have to try a Beorn/traps deck soon, which wasn’t an archetype that really existed before Entangling Nets!